Each course includes 8 weekly 1-hour sessions with up to 6 students. Class meets once a week for 1-hour at the same day and time. The price is $295. To register for a course please use links below, call 646-703-0007 or email NYGuitarAcademy@gmail.com. You do not have to travel with a guitar as we have guitars available at our studios for you to use in class free of charge. Please note that you will need to have a guitar at home to practice with. 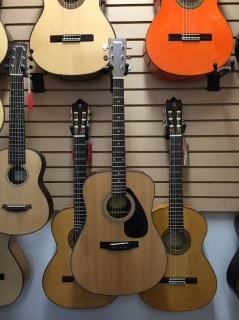 If you need a guitar for in-home use we do rent guitars for $30/month for you take home. We also sell quality beginner to advanced guitars and accessories as well. Please visit our guitar parlor to see what we have in stock. Beginner Blues Guitar class will teach you the basic of blues. You will learn how to play the 12 bar blues pattern along with the shuffle strum using 2 main keys. You will learn solo licks along with the major and minor pentatonic scales. You will learn how to integrate both rhythm and melody. Once these fundamental goals are met you will learn to improvise over the 12 bar blues applying the licks and scales from the beginner blues guitar class. You will continue to learn more rhythmic rhythms, scale patterns and licks widely used in blues guitar. ​Need a guitar? Purchase a beginner acoustic guitar pack below. It has everything you need to succeed. We will have it ready and tuned up for your 1st class!